Here's how destinations have used the five steps to improve their business. Tweed Valley Tourist Consortium has demonstrated that working together with other businesses has made them able to work effectively to promote their area. 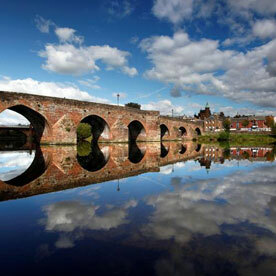 The group is a marketing consortium made up of over 90 tourism businesses in the Tweed Valley who have come together to promote the area and encourage higher stays and longer spend from visitors. In 2004 the consortium received innovation funding from the Tourism Innovation Development Award to develop a new interactive website map, and in 2009 it was awarded £60,000 through the LEADER initiative, which was matched by the public sector and the contributions from members of the Consortium for a three year period. working with the Council on the development of signage for the area. This success has largely been achieved because of the forward thinking of group members and the recognition that working in partnership creates real opportunities. Newcastleton Business Forum was established in 2009. Since then, members have worked together and in partnership with others to develop a range of events and initiatives designed to maximise the opportunities from the area’s world-class mountain-biking product. Two mountain bike events were created. The ‘Kielder 100’ in 2009, which saw over 200 cyclists attempt the 100 mile return trip from Kielder to Newcastleton, and the ’24 hour exposure’ in 2010, when participants took to local roads and trails for a 24 hour marathon on two wheels. A partnership with the ‘7 Stanes’ mountain-biking project has also enabled the group to develop a marketing presence at specialist shows including the Outdoor Show and Scottish Bike Show. The group’s success at catering for both road cyclists and mountain-biking visitors has seen Newcastleton become the first village to sign up to the new VisitScotland Cyclists Welcome Pilot scheme. Following an innovation workshop in 2009, the group were quick to develop a highly effective visitor feedback scheme which continues to build an excellent profile of visitors to the area. With the market intelligence gathered, the group developed a targeted marketing strategy, a range of marketing material including accommodation and village brochures and a comprehensive website. The group has also secured EU LEADER funding to allow further development work. Orkney Tourism Group was established in 2005 with the aim of sustaining and developing tourism on the island. The group is particularly aware of the importance of market intelligence as a driver and uses regular local visitor surveys to identify factors that are important for the growth of Orkney tourism and to guide future policy. Four short surveys are carried out each season, themed around shopping, eating out, transport and things to see and do. As well as gathering quantitative information, the surveys also provide vital feedback on the quality of the visitor experience. For example, the ‘out and about’ survey identified that visitors were struggling to find their way round the island. As a result the group joined forces with Orkney Islands Council to set up a working group to look at, and improve, signposting on the island. An annual ‘Seasonal Review’, carried out with businesses, provides comparator information enabling the group to benchmark how the season has been. Data from both surveys is shared with industry at the annual Orkney Tourism Conference. The information gathered from the surveys enables the group to successfully identify product and service gaps in Orkney’s tourism offer, and to develop new initiatives to better meet visitor needs and expectations. Cairngorms Business Partnership has worked hard to adopt a strong customer focus by using technology to improve the visitor experience and to gather feedback on what tourists thought about the area. In 2010 the Partnership launched the world’s first National Park iPhone app, giving visitors to the National Park the opportunity to obtain free, up to date information on where to stay, what to do and where to eat based on their location within the Park. Since the launch in November 2010, 3500 customers have downloaded the app and viewed over 70,000 pages. Customer feedback is gathered through the ‘Delivering an Outstanding Visitor Experience’ project, which allows real time, live and up to date customer information to be gathered electronically on hand-held devices at destination level by the partnership businesses themselves. This data is then analysed to enable comparative analysis between businesses, sectors and areas and to help the Partnership and individual businesses better understand their visitors and improve performance. A five-yearly Customer Survey carried out by the Cairngorms National Park Authority, along with the partnership's quarterly business barometer, also allows them to build a better picture of how the area is fairing. Taste of Arran, formed in 2001, focuses on the growing interest in locally-sourced food and drink, and brings together 11 premier food and drink producers from the Isle of Arran. Working together, the consortium has created a single point for sales, marketing and distribution of food and drink produced on the island. This pooling of resources has also increased purchasing power, driving down costs so that products can be offered at competitive prices. As a result, Taste of Arran produce can now be found in restaurants and retailers around the country, but the brand is particularly strong on the island itself. Seasonal produce is found on local restaurant menus, gifts can be picked up in the many shops throughout the island, and tours of Taste of Arran producers are available. More recently Taste of Arran has been instrumental in establishing Visit Arran, a destination management organisation seeking to develop Arran as the top UK island destination, building on the strong links already made with tourism operators and other local businesses. Royal Deeside and the Cairngorms DMO realised through analysis of a specially-commissioned market development study that there was real potential to integrate local food and drink more fully into the area’s overall tourism offer. Innovation workshops were held with local businesses to develop a strategy for improving the food tourism product in the area. The combined programme has helped to raise the profile of the area as a destination where the food and drink offering is treated seriously and is of an exceptionally high quality. Banffshire Coast Tourism Partnership has developed a series of initiatives to improve the quality of the visitor experience and help meet customer expectations. A ‘doors open’ initiative encourages businesses to visit each other, resulting in referrals to accommodation providers, visitor attractions and activity providers. ‘Banffshire Breakfast’ events bring local food producers together with tourism businesses, to help develop collaborative partnerships and improve the range of Scottish food and drink on menus. Businesses attending the Banffshire Breakfast events also receive training in how to prepare a breakfast using locally-sourced produce. St Andrews Standard is a Scottish Qualifications Authority accredited training programme for frontline staff working in tourism, hospitality and customer service roles. Designed by businesses in St Andrews working with the St Andrews Skills Academy, the training helps staff improve their customer service skills and local knowledge, motivating them to look for more and varied interaction with visitors. After a full day’s customer service training, participants must complete a challenging local ‘treasure trail’. In the three month period following the training, they are encouraged to produce evidence of how they have implemented the customer service and product knowledge skills they've learned. Once their manager and the St Andrews Skills Academy team are satisfied the learning outcomes have been achieved, the staff member will be awarded the St Andrews Standard. As a result of positive feedback, a programme called ‘The Standard’ has now been developed and is being rolled out across other parts of Fife. The introduction of the business-led training initiative has helped raise customer satisfaction levels, improved up-selling opportunities and encouraged a wider participation in training and development of key staff. Glasgow Service with Style is an industry-led initiative developed to support Glasgow's tourism vision of delivering a world-class customer service experience to all its visitors. Through a programme of workshops, visits and events, the aim is to raise standards of service across all touch points of the visitor experience. Events have included masterclasses for leaders and managers, learning journeys and best practice visits, local and product knowledge tours, ‘Leadership Development’ courses and ‘Train the Trainer’ courses. The flagship ‘Glasgow Welcomes’ customer service programme has been developed in partnership with local tourism businesses to help create a city acclaimed for its high level of service excellence. The Outer Hebrides Area Tourism Partnership Visitor Plan, developed by the Area Tourism Partnership, whose members include the Outer Hebrides Tourism Industry Association, is a well-conceived tourism destination plan to which industry and key stakeholders are fully signed up. The plan aims to maximise the benefits of tourism for the people of the Outer Hebrides, by developing a competitive industry, focused on quality and customer service, that is economically, socially and environmentally sustainable and that builds on its history, culture, environment and the hospitality of its people. Delivery is focused on meeting a series of long term outcomes based around the contribution tourism makes to the islands’ economy and society, how tourism integrates with other sectors, jobs and skills, the quality of the natural and built environment and the level of pride residents have in Hebridean culture and its appeal to visitors. Within the plan a number of specific projects, such as nature-based tourism, have been identified and an action plan developed for each. These plans are prioritised and reviewed on an ongoing basis and additional projects brought in as opportunities emerge. Some of these, such as cruise tourism, are being developed organically by other organisations. The Outer Hebrides Tourism Industry Association has also successfully sourced funding to enable the employment of a Tourism Development Officer to support the development and implementation of the plan and the Tourism Hebrides project. The Edinburgh Tourism Action Group carries out a biennial Edinburgh Tourism Visitor Survey which explores who visitors to the Capital are, where they come from and what experiences they are having, and uses the results to gain a better understanding of visitors and to share ideas. Businesses can access the survey results via a monthly monitor which is posted on the group's website. The group are constantly evaluating the survey process and making improvements. One recent innovation is to move from expensive face-to-face surveys to an online survey which enables data to be gathered more effectively in real time and be analysed monthly. The survey now also makes more use of open questions and dialogue boxes and uses clouds and other word analysis techniques to review results. This approach enables the group to identify any emerging trends which require more detailed work. The group also produces a series of Business Opportunity Guides which deal with topics of particular interest to businesses in the city, including the festivals, Edinburgh’s World Heritage Status and the evening economy. Development of the guides has been reinforced by a programme of complementary Business Opportunity Sessions, which explore each theme in more detail.